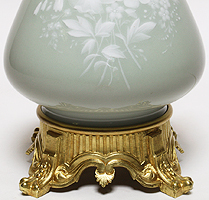 A Fine French 19th/20th Century Pâte-sur-Pâte Porcelain and Gilt-Bronze Mounted Ovoid-Shaped Table Lamp with a white low-relief floral design carved in slip and applied to a contrasting body over the blue-green porcelain. Circa: Paris, 1900. Pâte-sur-pâte is a French term meaning "paste on paste". It is a method of porcelain decoration in which a relief design is created on an unfired, unglazed body by applying successive layers of white slip (liquid clay) with a brush. The effect is somewhat similar to other types of relief decoration such as Jasperware, but as a mould is not normally used, the artist is able to achieve translucency. To understand pâte-sur-pâte fully, we need to go back to France in the 1850s, and an accident that occurred at the Manufacture nationale de Sèvres. They were trying to reproduce a decorative technique from a Chinese vase, but misinterpreting the vase, the experiment took them along an altogether different path from the Chinese potter. Be it luck or fate they perfected what became universally known as pâte-sur-pâte. You cannot talk about pâte-sur-pâte without mentioning the name of Marc-Louis Solon, who perfected the technique and was for most of his working life the leading exponent of the art; his works are today still regarded as the benchmark. Solon was born in France in 1835 and from an early age developed a considerable talent for art. Some of Solon's work later fell to the attention of the art director of Sèvres and he was soon after employed as a ceramic artist and designer. He was tasked along with H Regnault and Gelly to work upon the pâte-sur-pâte process which was still only at the trial stage. Left alone to perfect their skills, the artists at Sèvres reached a hitherto unheard of quality in their pottery. Praising the facilities of the day, Solon commented that "We were never limited as to time and cost", a luxury in any industry. Solon also began to produce pieces of pâte-sur-pâte in his own time under the name Miles, said to be based on his initials M L S. There are a number of these in the Victoria and Albert Museum's collection, as well as in the collection of the former Minton Museum. The Franco-Prussian War of 1870 led Solon to flee his native country and seek refuge in England, where he established contact with Colin Minton Campbell of Mintons Ltd, Stoke-on-Trent. Mintons had a history of employing foreign artists. Its first Frenchman arrived in 1848, the art director Léon Arnoux, followed by other French artists such as the sculptor Albert-Ernest Carrier-Belleuse, so Solon was joining a small continental community when he settled in Stoke-on-Trent and married Arnoux's daughter. The Solons brought up a large family at The Villas near the Mintons factory. To meet the demand for pâte-sur-pâte he was assigned English apprentices including Frederick Alfred Rhead. There ensued a golden age of pâte-sur-pâte in Stoke-on-Trent stretching into the early years of the 20th century. Minton remained the main producer of pate-sur-pate in the twentieth century, despite competition from other firms. However, Minton faced financial problems at the beginning of the twentieth century and pate-sur-pate became less important to the firm's output. 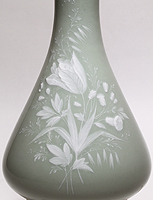 After Solon retired, his son Leon Solon was art director at Minton, but his interest was in Art Nouveau design. With Solon's death in 1913 and the advent of the First World War, an era had ended for pâte-sur-pâte. After the War its popularity declined like other nineteenth-century fashions. However, there was still some demand, and Minton continued to produce pate-sur-pate until the outbreak of the Second World War, when the production of decorated ceramics was severely curtailed. After the Second World War, the firm considered resuming production of pâte-sur-pâte, for which there was still some demand. However, with the passing away of Solon's apprentices, the scarcity of suitable artists posed a problem. It was not until 1992 that Mintons used the technique once more in order to mark the firm's bicentenary. The result was a small number of vases, produced to some degree of success, these later vases being reproductions of earlier pieces by Alboin Birks, a gifted apprentice of Solon, who used moulds to speed production and combat costs. Given the deindustrialization of Stoke-on-Trent in recent years, the 1992 revival of pâte-sur-pâte can be seen as Minton's swansong. The Minton factory has since been demolished, although tableware continues to be produced under the Minton brand-name.